Let me back up for you, shall I? Two timelines with a cast of characters, two stories, intertwined and bound by their past. 1986, it’s a time where peace is over. Humans have lived and worked among or alongside Cryptides till then. Werevolves learned to read and write in school side by side with human children and in restaurants you could be served right next to a table with visiting dryads or oracles. Rebecca Essig went out at night. She returns from a party and notices immediately that something is amiss at her family’s home. Her siblings and parents should have been asleep. The house is quiet. It seems peaceful…until Rebecca steps into sticky residue on the floor as she is heading upstairs into her room. Blood! Frantically she checks her siblings and parents rooms….her siblings are dead and her parents are asleep, with blood smeared all over. The world is at a crisis. The Reaping had begun. Civil Rights movements and protections have begun. Turmoil ensues. Delilah is on the run. She is bloodthirsty and pregnant. Or is it the baby that is bloodthirsty? Overdue, at 10.5 months gestation, she isn’t sure what she is having, but she will love this baby no matter what. A safe delivery where she will not be captured and transported to a lab as so many others, is her ultimate wish. In the company of shapeshifter Zyanya, Rommily, Gallagher and a few other friends, she is trying to do some good in the meantime. Headlines are showing two children have been captured into captivity. They are part of Rommily's family and they are planning to free them together. In return, they keep shelter together and prepare for the birth of Delilah’s child. As they head into the heart of the lab where different creatures are kept, Delilah’s thirst for blood grows exceedingly stronger, and a few bad apples on their mission will die. She is has mastered ripping out hearts to quench her needs. In a series of different events, the band has to fight their way through to the ultimate battle at the very end. The question is, will they succeed? Will Delilah be able to deliver her child safely and live? How about Rebecca’s family? How does the story intertwine? This novel is book three in the Menagerie series, and it is excellently crafted. A head spin of a tale. 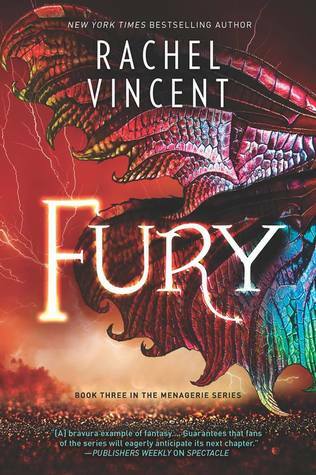 Timeless, retro and futuristic, Vincent wove a plot of different elements and genres into a mindboggling novel. Part thriller, part sci-fi it delves into the plight of humanity on the brink of an evolutionary sci-fi future without failing to deliver an emotional plot. Change, laws, order, up rise! A shift in humanity, the acceptance and change in the way of life. What a book. I really enjoyed this novel. It reads easily and is fast paced. Almost cryptically the reader is taken through the timelines and memories, but it never really comes together till the end, and it left me at the edge of my seat. This book is great for lovers of paranormal / urban fantasy. I received a digital copy of this novel from Netgalley in exchange of an honest review. All opinions are my own. Thank you!